Like most imagers, my equipment has changed over the years. Initially I started using an old fork mounted Meade SN8. That scope suffered from poor optics with lots of astigmatism, but it was fast at f/4 with a wide imaging field. Next came an improved (at least somewhat) mount, a LXD650 Meade German equatorial mount. My next upgrade was to replace the SN8 with a f/5 SkyWatcher imaging Newtonian. I still have this scope and occasionally ues it for visual work. It has excellent optics and a great focuser for visual work, but the tube deflects slightly when a camera is mounted making for some strange looking stars on one side of the image as the scope moves around the sky. My next upgrade was to change the mount to a Celestron CGE Pro. 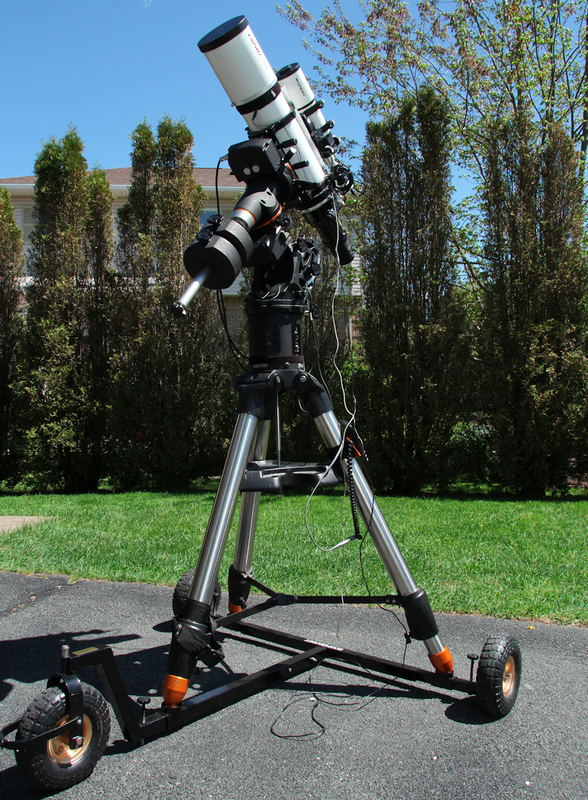 This mount is a beast, but very stable and tracks extremely well with smooth periodic error that is easy to guide. I can't say enough about the all star polar alignment routine, polar alignment now takes about five minutes after sky aligning and produces accurate results every time. My final upgrade was to change the optics to a SkyWatcher Esprit 120 APO refractor. My main reason for this upgrade was to get rid of diffraction spikes and large halos around bright stars. It took SkyWatcher a couple of tries to get me a scope that did not suffer from pinched optics (they had a batch related problem), but the wait was worth it. The focuser on this scope is rock solid with no slop or movement during focusing. It doesn't even shift when locking it in position. An Orion short tube 80 mm guide scope, an Orion Star Shoot Autoguider and a ScopeBuggy round out my gear. With the addition of the ScopeBuggy I have an observatory that I can simply wheel out of the garage and be imaging in under 20 minutes.